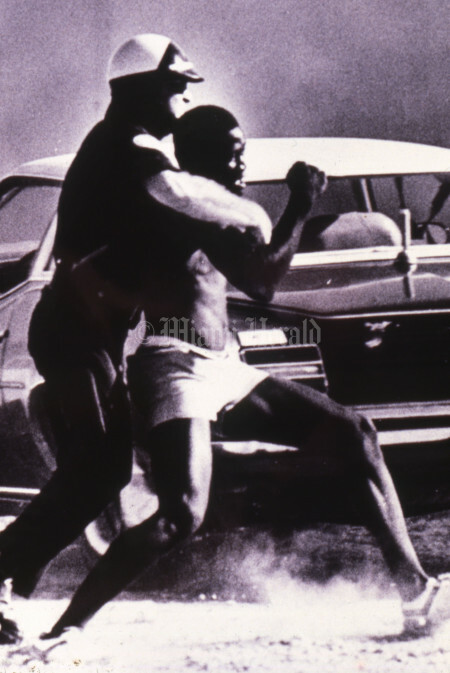 Only a sign at 62nd and Northwest 17th Avenue that proclaims ”Arthur Lee McDuffie Avenue” offers an outward clue to the ferocity that erupted in May 1980, sweeping through the city’s black communities with a rage that would cripple Miami for years, even decades. Four white police officers were acquitted by an all-white jury in the death of McDuffie, a black Miami insurance agent. 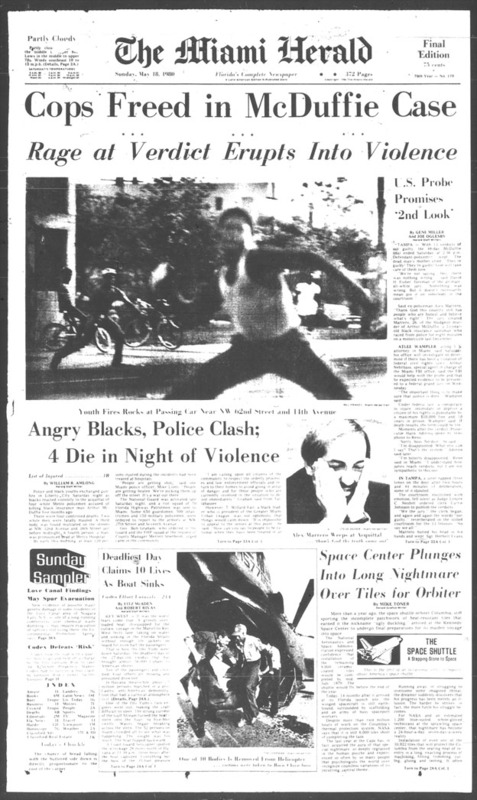 McDuffie, a Marine, had been fatally beaten while handcuffed after a police chase by a group of white police officers, who then tried to cover it up as an accident. The verdict, coming as the black community’s relationship with law enforcement reached an all-time low, sent people pouring into the streets. 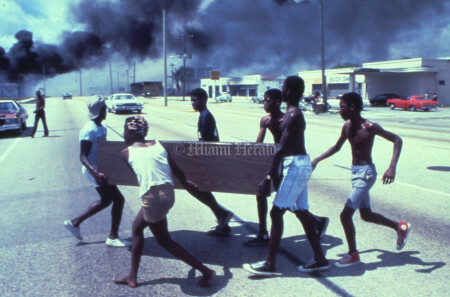 A three-day rampage of fury and grief followed, escalating with frightening speed in Liberty City, the Black Grove, Overtown, and Brownsville, killing 18 people, costing 3,000 jobs and causing $100 million in damage. 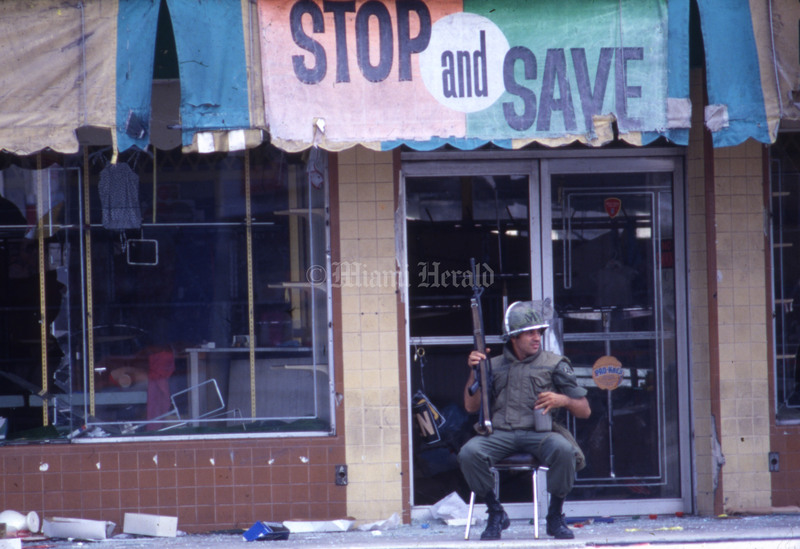 5/18/1980, Bruce Gilbert/Miami Herald Staff: National Guardsman stations himself on chair to protect store. 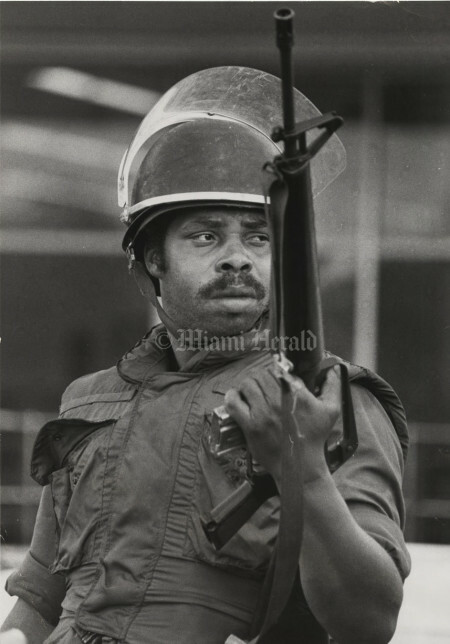 5/18/1980, Marice Cohn/Miami Herald Staff: National Guardsman on duty at the Zayre's Department Store on Northwest 54th Street. 5/19/1980, Bruce Gilbert/Miami Herald Staff: Shattered storefront. 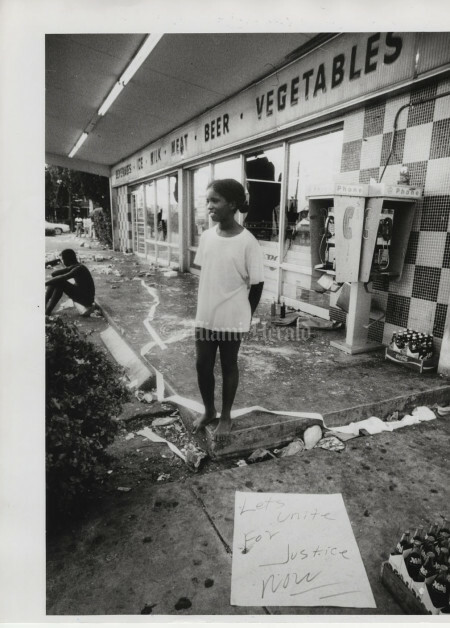 Sign on sidewalk reads: "Let's unite for justice now." 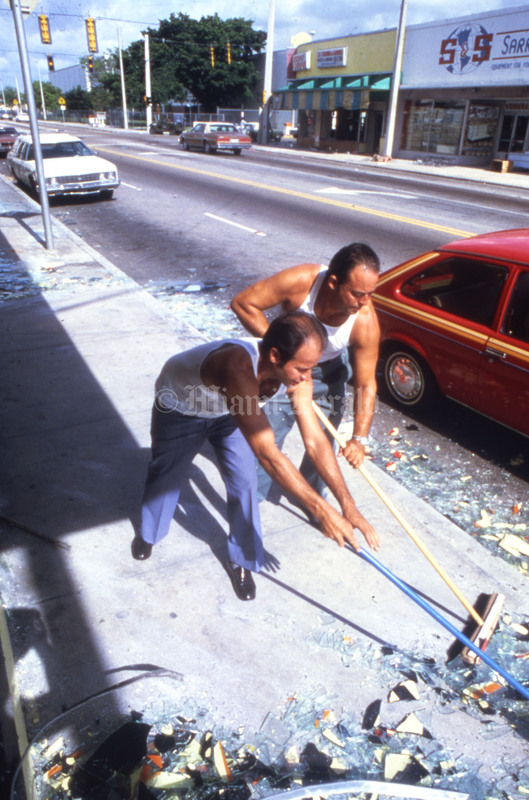 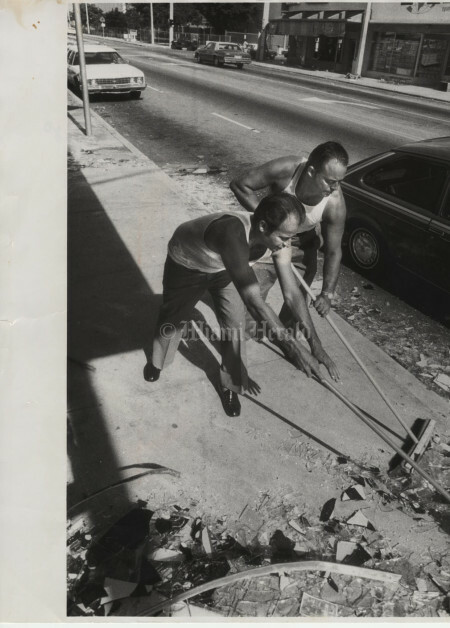 5/18/1980, Bruce Gilbert/Miami Herald Staff: Storekeepers sweep shattered glass from sidewalk. 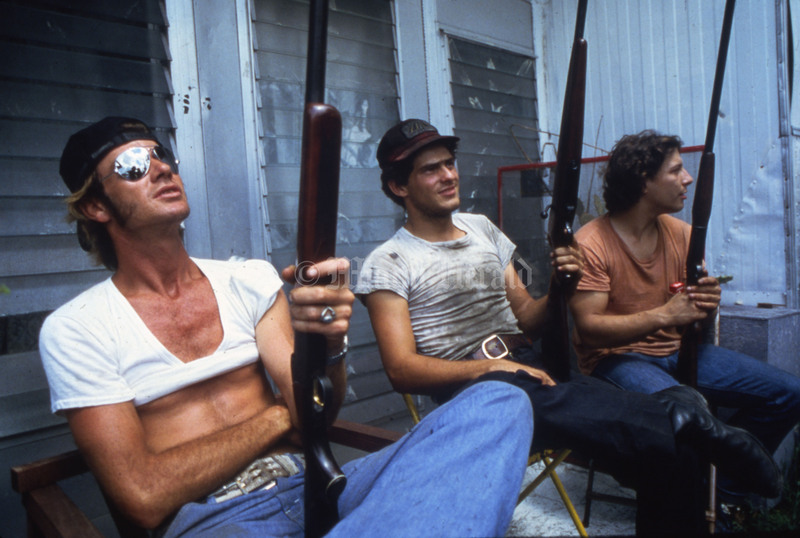 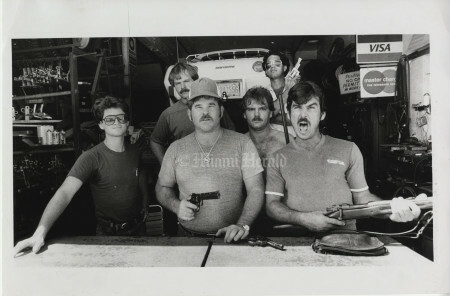 5/18/1980, David Walters/Miami Herald Staff: Shotguns aid self-appointed security men at trailer park on NW 27th Avenue; the three had turned one suspected looter "over to the cops" the night before. 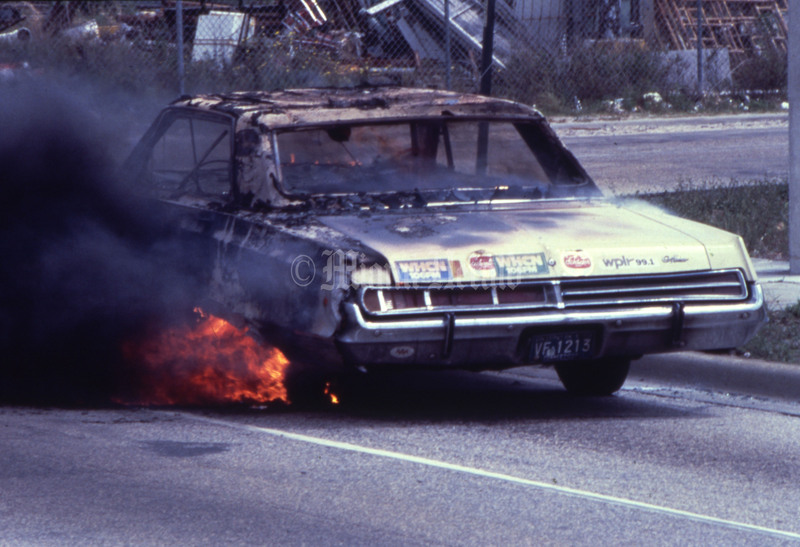 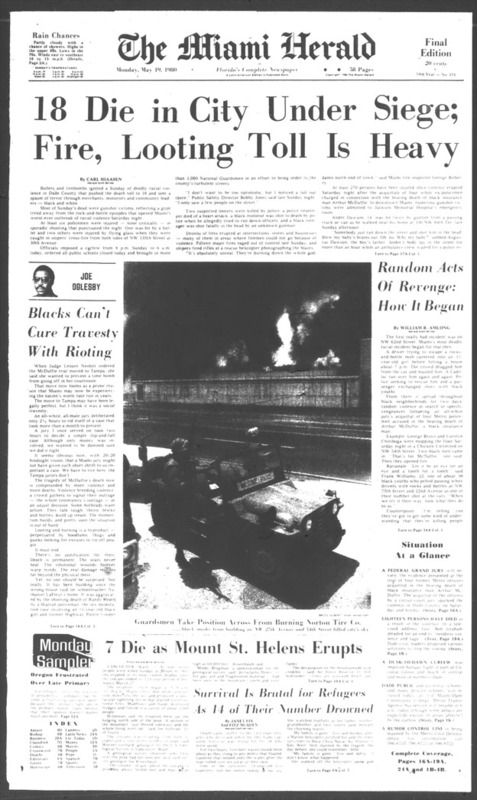 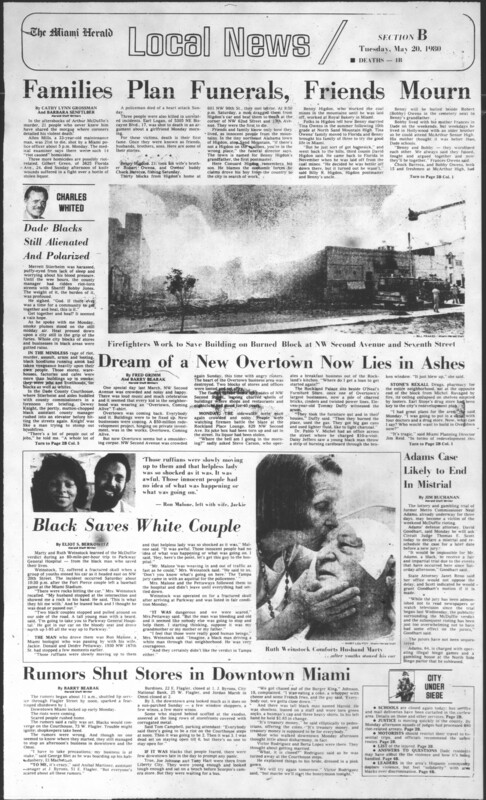 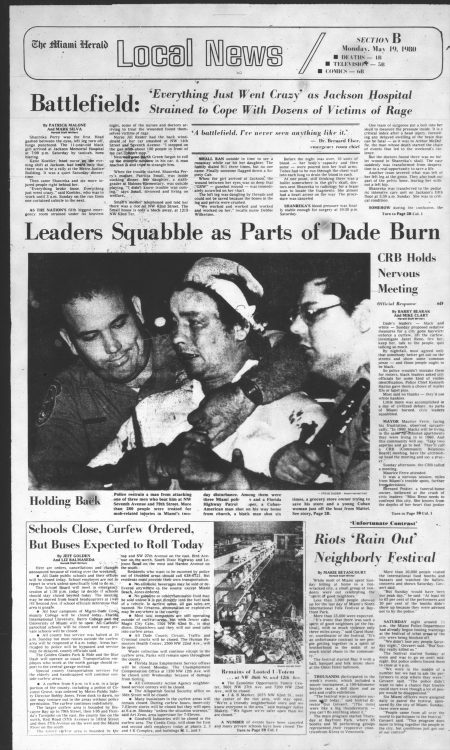 5/18/1980, Richard Johnson/Miami Herald Staff: Car with Connecticut license tag goes up in flames on Northwest 54th Court. 5/23/1980, Tim Chapman/Miami Herald Staff: Aerial view looking south along Northwest Second Avenue from the 1100 block up toward Northwest Eighth Street (running from left to right at the top of the photograph). 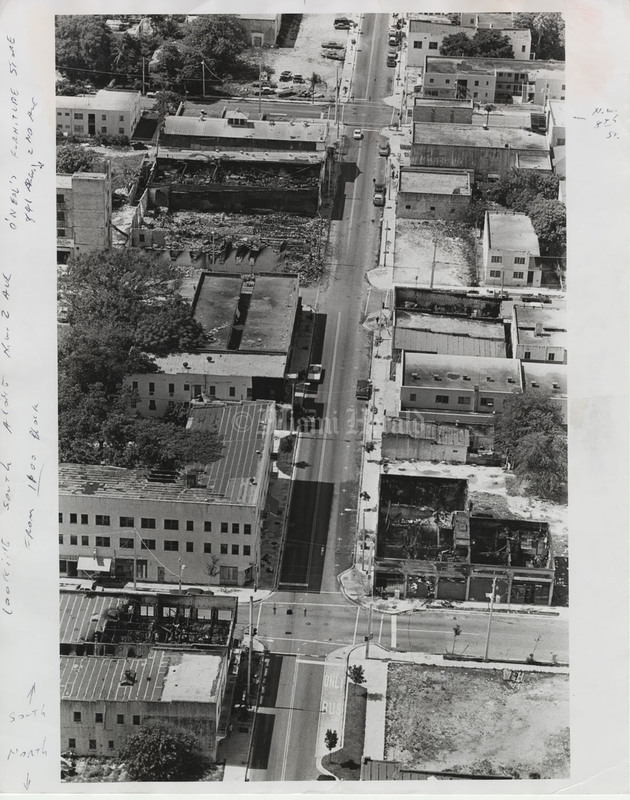 O'Neal's Furniture Store at 841 NW Second Avenue is in ruins at top left. 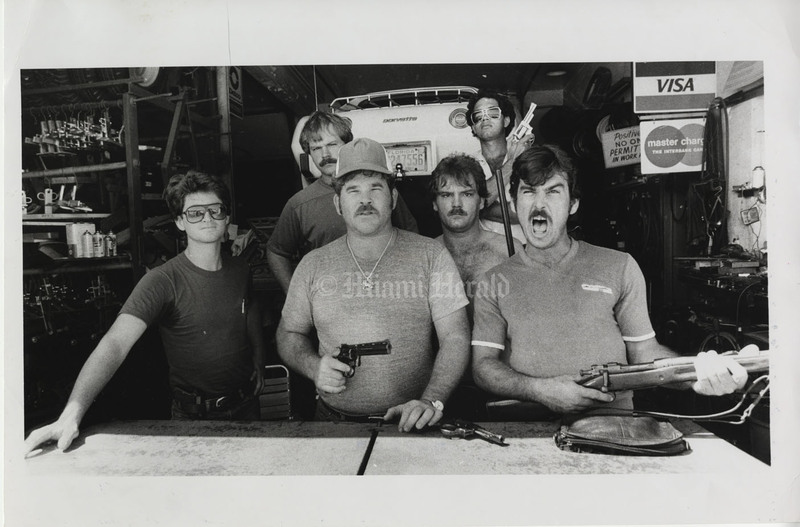 5/19/1980, Bill Frakes/Miami Herald Staff: Store owners on Northwest 79th Street ready to defend their store. 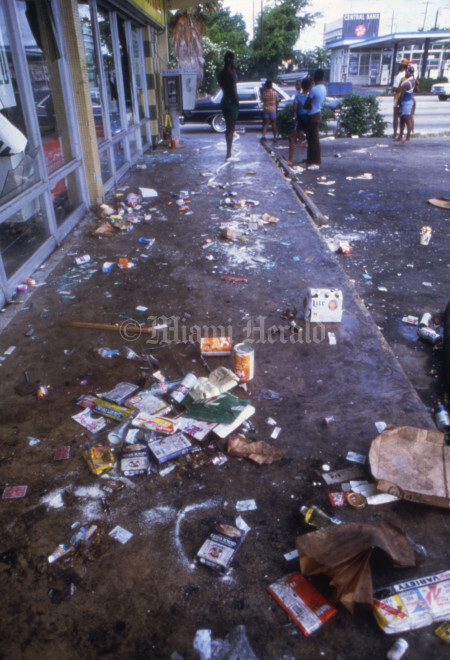 5/18/1980, Bruce Gilbert/Miami Herald Staff: Litter is scattered outside U-Totem store in Northwest area; the Sunday morning scene was echoed at other places of business. 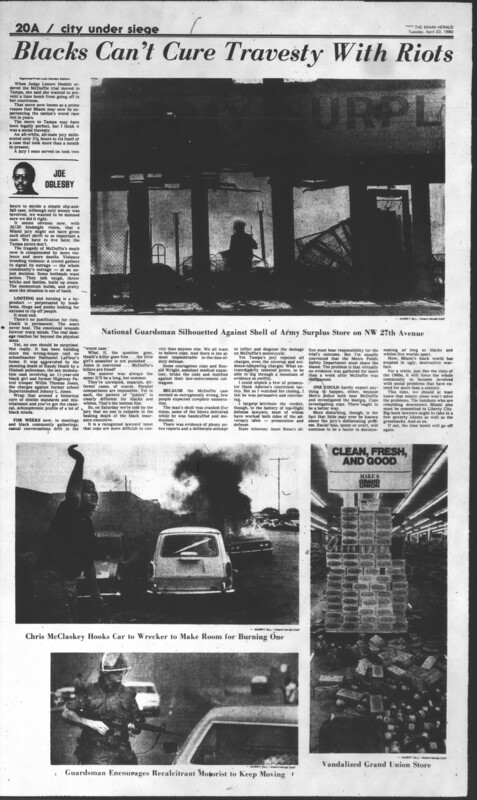 5/20/1980, John Walther/Miami Herald Staff: All quiet on the Northwest front. 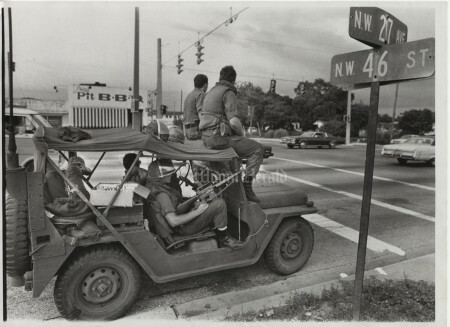 Natioinal Guardsmen standing watch at Northwest 27th Avenue and 46th Street as one takes a snooze in the back of jeep. 5/18/1980, Bruce Gilbert/Miami Herald: Blood and dirt cover two men arrested at Zayre's Department Store on Northwest 54th Street Sunday afternoon. 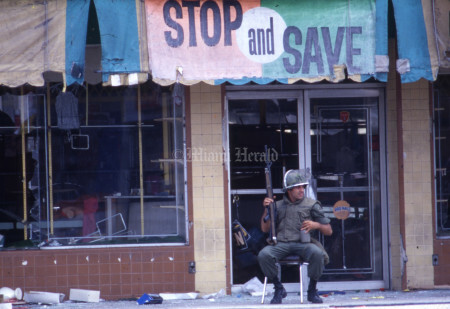 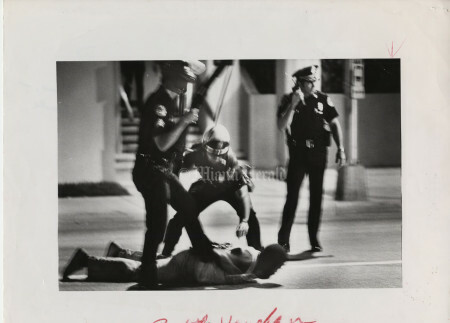 5/18/1980, Murry Sill/Miami Herald Staff: Police officer tackles looter at Zayre's store on 54th Street. 5/19/1980, Murry Sill/Miami Herald Staff: Guardsman encourages recalcitrant motorist to keep moving. 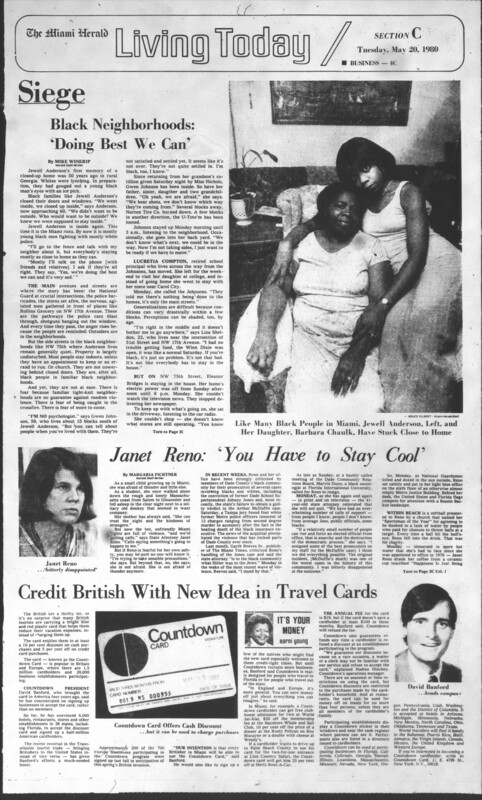 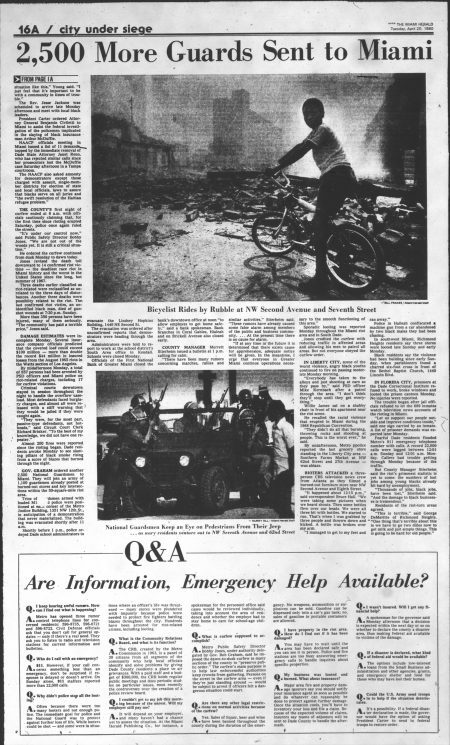 5/17/1980, Battle Vaughan/Miami Herald Staff: Police arrest man on first night of McDuffie riot near Northwest 14th Street and 12th Avenue. 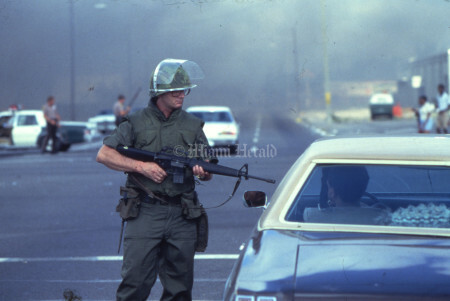 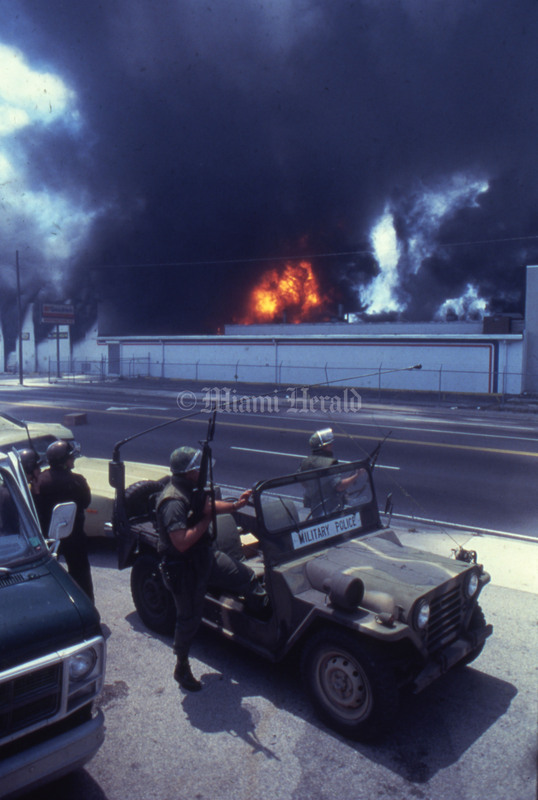 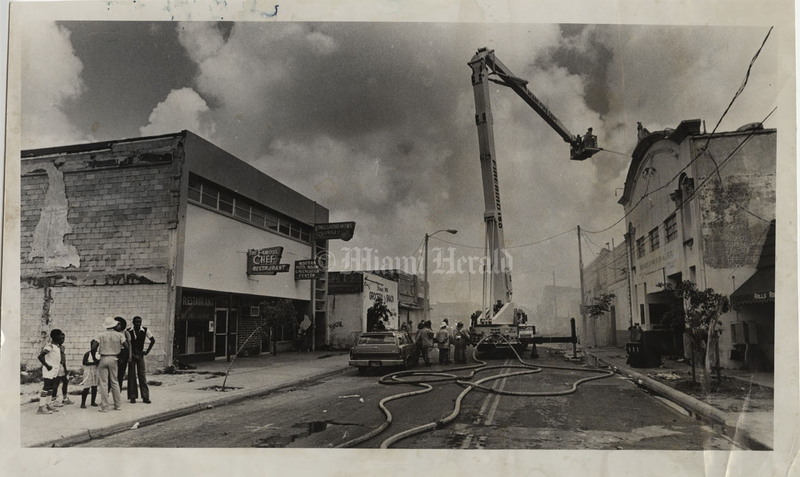 5/18/1980, Bruce Gilbert/Miami Herald Staff: Guardsmen take position across from burning Norton Tire Co.; black smoke from building at Northwest 27th Avenue and 54th Street filled city's sky. 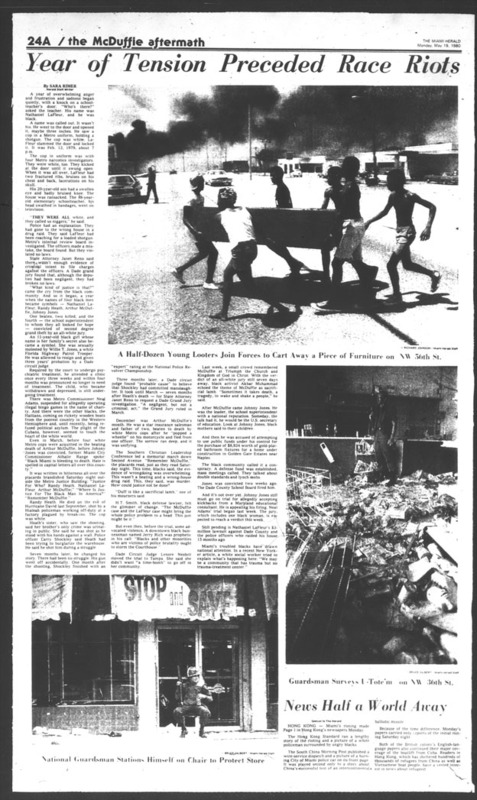 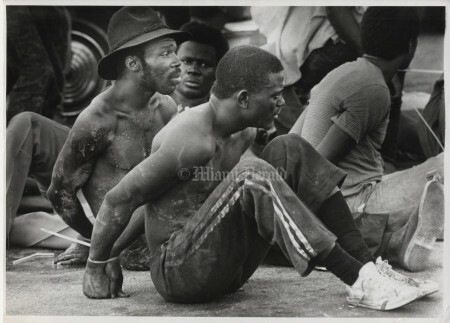 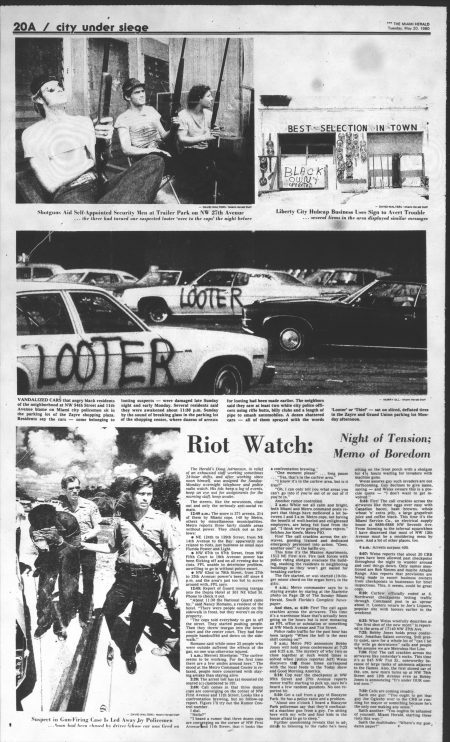 5/18/1980, Richard Johnson/Miami Herald Staff: A half-dozen young looters join forces to cart away a piece of furniture on Northwest 56th Street. 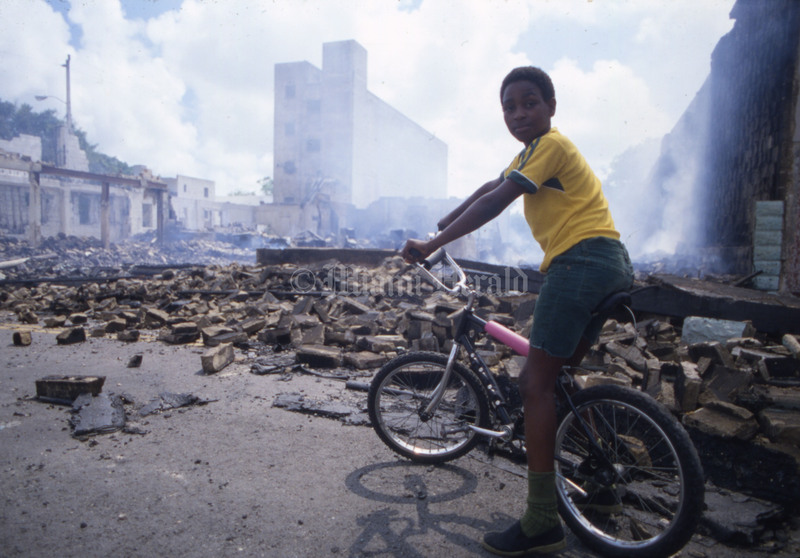 5/19/1980, Bill Frakes/Miami Herald Staff: Tommy Duffy rides by rubble at Northwest Second Avenue and Seventh Street. 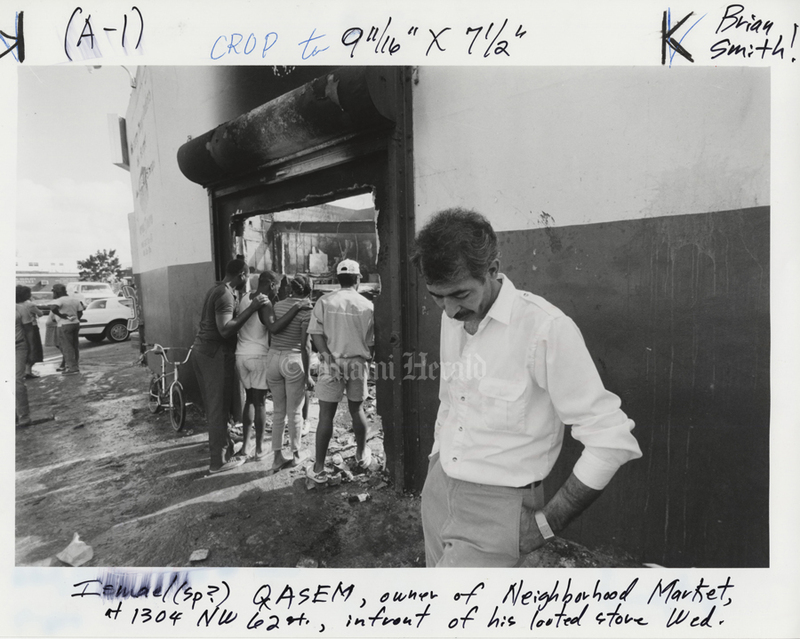 5/18/1989, Brian Smith/Miami Herald Staff: Two stores managed by Ismael Qasem, right, were ravaged by looters. He is shown at Neighborhood Market, 1304 NW 62nd St. Racial demonstration followed shooting by Miami Police Officer William Lozano and the deaths of Clement Lloyd and Allan Blanchard. 5/17/1989, Jon Kral/Miami Herald Staff: In the eerie glow of a burning warehouse, two women and a dog cautiously walk down an Overtown street Monday night. 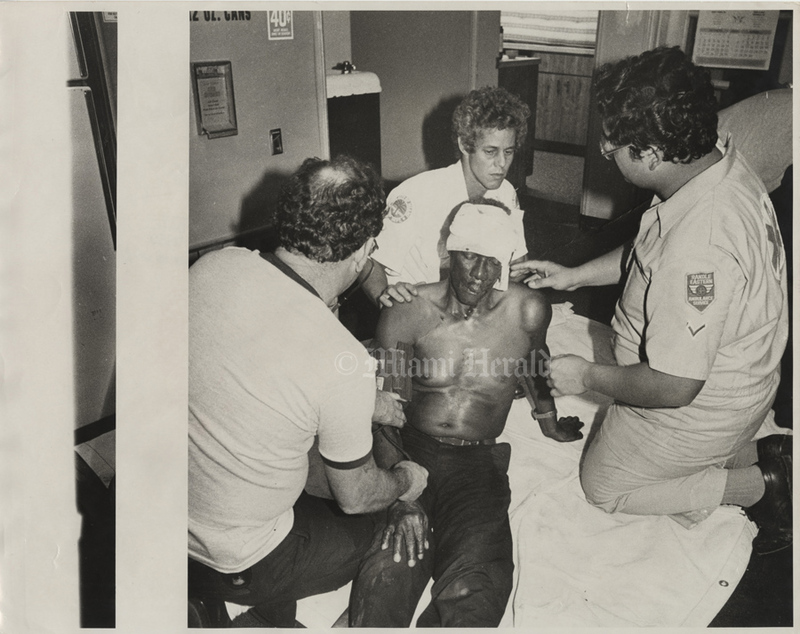 Racial demonstration followed shooting by Miami Police Officer William Lozano and the deaths of Clement Lloyd and Allan Blanchard. 5/22/1980, Steve Dozier/Miami Herald Staff: Injured man aided by Randle Eastern Ambulance Service crew member and Miami Fire Department paramedic. 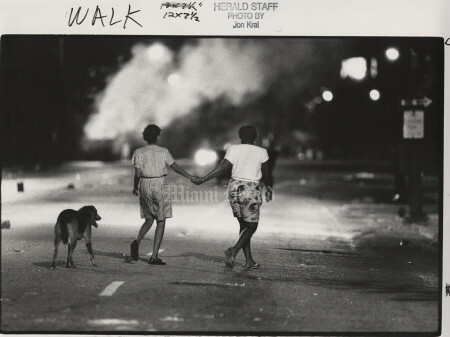 Buy photos in the Herald store.